Post card brief... Just got back to Sweden from a two day round trip cruise to Helsinki. The ride through the Stockholm archipelago on an evening bathed in the northern summer light was marvelous. I see that the X PRIZE press conference revealed some exciting news about the SpaceShipOne schedule. It will be tough to decide which of the flights I will try to attend. Jeff Foust posted several links to several articles about the announcement in this item: Scaled announces X Prize flight plans - spacetoday.net - July.27.04 and has many others included in his daily space news list at spacetoday.net. Also, check out the X PRIZE Space Race News postings. Sure hope the da Vinci guys have done lots of major subsystem tests. The first flight is going to be an "all up" test. Feeney, though, believes it's worth the risks: Getting A Run For Your Money In Space - SpaceDaily - July.27.04. Probably no more updates till next Tuesday. Budget downs and ups... As Jeff Foust indicates, the game is just starting on the appropriation process and the current numbers are just an opening bargaining stance. There are powerful forces pushing to restore the funding for the new initiatives, e.g. Cuts could doom spending bill www.GovExec.com - July.20.04. X PRIZE press conference next week will announce the start of a 60 day countdown to the start of flights to win the prize: X Prize countdown begins - Alan Boyle: Cosmic Log - July.21.04 *- X Prize announcement planned next week - spacetoday.net - July.21.04. "one or more competing teams may announce plans to conduct flights to win the prize. The press conference is scheduled for Tuesday morning, July 27, in Santa Monica, California, according to a media advisory issued Wednesday." Shuttle operations aer fully funded but anything new and exciting got zeroed out: Highlights of FY 2005 VA-HUD Appropriations Bill (via spacetoday.net). Sounding for help... Professor Kristina Lynch of Dartmouth College writes in the current issue of Space News about NASA's struggling sounding rocket program. Despite the recommendation of the National Research Council Solar and Space Physics Decadal Survey to reinvigorate sounding rocket research, the agency will actually cut funding from its current $30M level rather than double it to $60M as many researchers hoped. NASA privatized the sounding rocket program a few years ago. The NSROC (The NASA Sounding Rocket Operations Contract) is a consortium of private companies that works with Wallops Island to provide sounding rockets for space and earth science researchers. According to Prof. Lynch, the number of yearly launches has dropped steadily from 30 per year in the mid-1990s to 20 since the privatization and it will probably drop significantly less than this if funding continues to fall. In fact, they cannot even afford to fly missions out of White Sands because of the launch fees there. Science missions are often listed as a possible secondary market for reusable suborbital vehicles. Some science missions need to go significantly higher than the standard 100km altitude that most suborbital projects aspire to, but a lot of research could clearly take advantage of the low launch price and frequent flights offered by suborbital space transports. However, it doesn't look to be a lucrative market. Suborbital bombast... Perhaps Prof. Lynch should leave sounding rocket research anyway since Prof. Jeffery Bell, also known as The God of AeroSpace (GAS), says rockets don't reach space if they don't reach orbit: StuntShipOne: The GeeBee Of Outer Space - SpaceDaily - July.20.04. Be sure to put on your raincoat and galoshes before encountering this mudslinging screed. On the other hand, if an engineer in R&D like Burt Rutan develops a virtually endless stream of new technologies and techniques but doesn't directly create a product as popular as pens and pencils, an academic like GAS feels perfectly justified in trashing him. That "basic engineering" is not given the same respect and prestige as basic science is not a rational, defensible attitude. It arises from the fact that science traditionally takes place within the ivory tower university environment where all pursuits are pure, just, and noble. Engineering mostly happens out there in the grubby, ugly world of commercial enterprise where everybody is only after the ugly buck. However, we should remember that it is that world of practical engineering that created the wealth that pays for all that basic research. Of course, many scientists feel successful engineering is just a trivial consequence of good science. Actually, it's often the other way around. BTW, someone should send Bell a link to ZERO-G. He should also be told never to ride on a 777 or the future Boeing 7E7 since they are 12% and 50% composite, respectively. He should certainly never launch any science payloads on the Orbital Sciences Pegasus, which was designed in partnership with Scaled Composites and which is built with components from the company. X PRIZE News new website... The ANSARI X PRIZE Space Race News! web site has a great new look and a new URL - www.xprizenews.org. It includes a well organized page on the teams. The Armadillo update reports on various construction projects. MiG-25 - US$9,992 - the Foxbat can reach 82,000 ft / 25 000 m.
These prices don't include the cost of the trip to Russia. Space Adventures offers similar packages but with enhanced prices. Their MiG-25 and Mig-29 packages each go for $19k. I wonder how many customers have paid these and other companies for such flights? Seems like I've seen numbers in the few thousand range. The price most often cited for the first suborbital tourist tickets is $100k. Space Adventures, for example, is taking reservations at $98k for a ride as soon as a suitable vehicle becomes available. It's reported that several dozen people have placed $6k deposits already. Burt Rutan has indicated that a vehicle with 5 or 6 passenger capability could provide rides in the $50k range. He also wants a vehicle that can go higher than 100km so as to provide a longer weightlessness period. Space prizes workshop update... Ken Davidian of the Centennial Challenges program says that he has updated the summary report (pdf) a couple of times since it was first released on the 13th. He will continue to revise it as additional information comes in from the session moderators. He has added a Revisions Table to the beginning of the report to document the changes. The Centennial Challenges Workshop summary report (pdf) is now available (item via Transterrestrial Musings). First Falcon I launch still planned for September but " not launch until all engineers are two thumbs up, so that date may get pushed back." There will be a public viewing for the launch. More info as the launch time approaches. Launch manifest shows 3 launches for Falcon I and two for Falcon V. This includes one "tentative" payload for each, meaning that no contract has been signed but chances are better than 50% that they will sign up. Construction of the launch pad at Vandenberg is coming along. Note that they "do not use a permanent tower on the pad, employing instead our mobile erector/launcher platform." The tower is stored inside a building, which minimizes corrosion and weather affects and reduces maintenance costs. Significant step for their propulsion development: they "fired Merlin (our main engine) in the fully integrated configuration, with both the thrust chamber assembly, turbo-pump and gas generator attached to a set of flight tanks. This is one of the biggest milestones before launch and the culmination of a tremendous amount of work by the propulsion team." A qualification program now begins for the engine to determine if it is "rock solid reliable"
Tests were made of the fairing and stage separation systems. He notes that they are trying to avoid explosive bolts on the rocket but for the stage separation - "we can’t yet obtain the non-explosive separation nuts with sufficient strength to hold the stages together under maximum load." The stage separation test also tested their avionics, computer, relays, wiring harness, and inertial measurement unit (IMU). The computer is "probably the most powerful rocket flight computer in the world, since it is the most recently designed and the only one to use current 21st century technology." Antenna patter tests were made. "The rocket is truly a flying radio station, with two C-band, four S-band, two UHF and two GPS antennas, as well as a beacon antenna on the first stage for location by the recovery ship". ARCA finished the ground tests of the Demonstrator 2B engine, fuel tank and electric/electronics system. Right now we are working to the final assembly of the launch complex. The discussions with the authorities for the launch approvals are underway. The first launch is expected in short time. The exact date and location will be communicated as soon as the discussions will move forward. World first composite materials reusable monopropellant rocket engine will be tested in flight in July on board of the Demonstrator 2-B rocket. The first flight will be made below 10 km, mainly because of the launch site restrictions. This technology will be used on board of the ORIZONT vehicle, on manned flights, starting with the next year. Soon after the demonstrator flight, the ORIZONT vehicle will be presented to the media and public. Budget suite with a view... The Bigelow project continues to lower the curtain on what they are doing: Inflatable Space Outposts: Cash Down on High Hopes by Leonard David - Space.com - July.14.04. “Several years ago, I thought about how much money I personally would be prepared to spend over what period of time. I expected that I may have to put up and invest as much as $500 million by the year 2015. I stand by that. I still think that’s very possible,” Bigelow said. So what’s wrong with this scenario: Private space modules, launched on private rockets, and visited by privately-built space ships? That may not be too far-fetched. Along with Bigelow, there is a growing guild of millionaires and billionaires now tossing in their own bucks to back an array of space ventures. “We’re all aware that we’re somewhat co-dependent on each other,” Bigelow made clear. “We kind of know each other. We kind of keep track of who is doing what,” he said. Space bill movement... According to the latest Space News (print edition) Senator James Inhofe of Oklahoma plans to release his hold on the Commercial Space Launch Admendments Act (H.R.3752) by July 23rd. He put the hold on because of the concerns of Rocketplane Limited, based in Oklahoma, that the bill would relegate its vehicle to FAA aviation certification procedures rather than to the AST launch licensing regime. The XP spends most of its time under turbojet power before it fires a rocket to go to 100km. Rocketplane lobbyist Kevin Kelly said, "We're getting close to resolving the whole thing." Unfortunately, time is getting very short before Congress takes a six week break. The bill's backers hope a deal can be made by July 20 when the Senate Commerce Committee will hold a mark up session. The SpaceShow archive now holds the Space Ship One broadcast from June 21, 2004. This special Space Show program featured author John Carter McKnight (of "The Spacefaring Web" commentaries) on location and David Livingston in San Francisco. The original three hour and forty minute broadcast has been edited to one hour, 45 minutes. David assures "all the listeners that this is the full broadcast of the events this historic morning". Overview FAA/AST Suborbital Market Study - Paula Trimble - in development for release in October. Armadillo update ... John Carmack reports on miscellaneous hangups in their test program: Electronics Failures - Armadillo Aerospace- July.11.04. Includes a video (mpeg) of a hover test. "Permission to believe" in a Moore's Law for space launch? - The Space Review - July.12.04 - Rand Simberg has already commented on this but I have to jump in as well. I can't emphasize it too much or too often: we don't need no stinkin new technology to get launch costs way, way down. We just need robust equipment that can run often and can last for many flights with minimal refurbishment in between flights. Economies of scale have worked amazingly well for a couple of centuries in lowering the cost of everything. There is no law of physics that says this won't apply to spaceflight. If the number of flights increases to hundreds and then thousands per year, the costs will come down until, as Rand points out, you hit bedrock expenses like fuel. Then you can start looking seriously at space elevators and other exotic techniques to push it further on down. Suborbital Institute gets new director... Citing the demands of a growing company, Pat Bahn of TGV Rockets has given up his position as Washington Director of the Suborbital Institue. The SOI s a trade association that promotes "the interests of practical human suborbital rocket powered flight" and includes many of the leading companies in the industry. Interim director will be Andew Case. Dr. Case is a plasma physicist at the University of Maryland who has been actively involved with the SubOrbital Institute since its inception. He says that he has been a space enthusiast since childhood and he "believes that the member companies of the SubOrbital Institute are the best hope for opening the space frontier for everyone." Update: Andrew posts a statement at Transterrestrial Musings on his apppointment. FREDERICK, OKLA (July 8, 2004). Frederick, Oklahoma rocketed into a new era on July 4th when Beyond-Earth Enterprises launched an 8-foot-high test rocket at the newly-christened Capps Space Sciences Center. This one-third scale vehicle tested some of the design features of their unmanned craft which will carry payloads up to 100 km (62 miles). These flights to space are expected to begin in Tillman County within the next twelve months, contingent on funding and regulatory issues being worked by Frederick and Beyond-Earth. Beyond-Earth CEO Joe Latrell explains that Beyond-Earth is poised to make space history in Oklahoma: "We’re following in the footsteps of Burt Rutan’s historic flight in Mojave. We’re here to make ‘space available’ to everyone. And Frederick, Oklahoma is a great place to start." spaceport license, and the Capps Center will be working the licensure issues in parallel with Beyond-Earth's engineering tests and development. The Center is named after Oklahoma State Senator Gilmer Capps (D-Snyder) who has been instrumental to the evolution of Oklahoma as a primary site for entrepreneurial aerospace companies to develop their businesses. At the July 4 event he was given a commemorative plaque to mark the Capps Center's beginnings. The plaque was awarded by Donna Shirley, Director of Seattle's Science Fiction Museum and Hall of Fame, at a ceremony also attended by Rep. Don Armes (R-Faxon) who represents Frederick. Besides test instruments, the rocket carried the first "Bearonaut" teddy bear astronaut, which was taken by Ms. Shirley after its flight for donation to a young cancer patient. Beyond-Earth staff also ran a "Super Top Secret Rocket Scientists Only" area for kids of all ages to build rockets powered by "Substance AS" (otherwise known as Alka-Seltzer). The day was not entirely perfect: the parachute meant to carry the payload to the ground failed to open, causing the spent rocket and its cargo to fall to the ground and break up. The team recovered the payload and will analyze their flight data, determine what has happened, and return to Frederick for another subscale test flight. As one young visitor enthused after the launch of Beyond-Earth's rocket, "Do it again!" The Capps Space Science Center looks forward to Beyond-Earth's next flight. ABOUT BEYOND-EARTH ENTERPRISES (www.beyond-earth.com) Originally an X-Prize competitor, Beyond-Earth is leading the way to commercialization of space by providing small payload launch capabilities at affordable rates. Beyond-Earth officers are committed to revitalizing the American Public's interest in Space and conducts educational demos and lectures at area schools. The company is headquartered in Colorado Springs, Colorado with launch facilities at the Capps Space Science Center in Frederick, Oklahoma. ABOUT THE CAPPS SPACE SCIENCE CENTER: The Capps Space Science Center is a consortium of Frederick-area entities, including the City of Frederick, Frederick Chamber of Commerce, and Global Space League, which is working the regulatory issues related to launches of rockets from Tillman County. At the same time the Center is working with universities and other scientists to create a supportive and collaborative environment for early-stage air and space companies to grow their businesses and maintain technological excellence while encouraging active involvement in flights and related activities by students at all levels. ... I've heard that the Senate schedule is such that either HR.3752 gets accepted by July 20th or it's no go for this year. Budget space suite ... Another interesting article about Bigelow Aerospace: The ultimate public-private partnership: Bigelow, NASA now working together on space hotel - Las Vegas Mercury - July.8.04 (via spacetoday.net.) Althought the author seems to be unclear on the difference between suborbital and orbital spaceships, he does a good job of connecting Bigelow with other private space ventures such as SS1. Rutan has mentioned recently that he is thinking about designs for orbital transport. Perhaps it's because Bigelow has convinced him that a habitat will be there waiting for visitors. "We are definitely moving in the same direction and on a parallel path with Bob," says NASA's Miller. "He's come a long way in a short time and we want to make sure that he succeeds. We're building real hardware here and it's destined for space." If the agency took a similar supporting role to the private space transport companies, it would accelerate development considerably. September in space... Scaled Composites has determined the causes of the two serious problems during the June 21 flight. Burt Rutan now says the "flight-control anomaly" ... was not serious." Wind shear during the ascent caused the vehicle to go off course. They are now planning for the first X PRIZE flight: SpaceShipOne Back on Course - Wired - July.7.04. ... SpaceShipOne - the musical . Sing along to Rutan Spaceship by Chuck Devine - Samzidata.net and Spaceship Yourself by Terence Chua. ... Note the line with the above article: "A weekly series by United Press International exploring the people, passions and business of suborbital manned spaceflight." Nice to see UPI making such a committment to this area. In celebration of July 4th, Space Transport Corporation (STC) launched a two-stage rocket to 56,000 feet (17.0 kilometers). This flight proved out the recovery system and resulted in excellent high-altitude digital pictures. STC plans a three-stage rocket launch to 60 kilometers later this month. This two-stage launch was, in a way, a final tuning flight prior to a 60 kilometer shot. The two- and three-stage rockets are four inches in diameter. The 60-kilometer flight test is separate from the Rubicon launch, which will stay on track for a launch in the second half of July. [Pictures from the flight, including on at apogee, are available in their gallery and in the PR]. The onboard camera took pictures every 4 seconds throughout the flight. Apogee was achieved approximately 50 seconds after liftoff. The peak speed was 2450 mph or Mach 3.4. 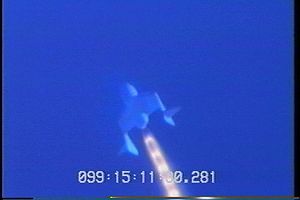 The expected slight ablation (when material “melts away” during high-speed flight through the atmosphere) was seen on the rocket’s nosecone. Okie rocketeers ... In the latest edition of Space Review, Jeff Foust reports on the RLV friendly environment in Oklahoma: Oklahoma is OK for suborbital - The Space Review - July.5.04. He focuses on developments with the companies Rocketplane Ltd. and TGV Rockets that are now based in the state. Jeff gives some of the details behind the tax credits deal that Rocketplane got from the state after showing that it had $30M in capitalization. The company will use the money obtained from selling the credits to develop its XP suborbital vehicle. Derived from a Learjet, the four seater rocket/jet combination vehicle will pursue the tourism market. They plan first flights for late 2006. TGV Rocket has not gotten tax credits from the state but has gotten other benefits such as a close working relationship with the Aerospace and Mechanical Engineering Department at the University of Oklahoma in Norman. The company now has a dozen or so engineers working hard to meet a preliminary design review deadline. Currently the funding comes mostly from a Defense Department grant. First flight of the vertical-takeoff-and-landing Michelle-B is 2007. A patently bad strategy... The Space Review also includes an article from Sam Dinkins who warns RLV startups that it's not a good bet to expend a lot of energy and money on patenting their technologies: Patents are not pat hands - The Space Review - July.5.04. Bigelow - big time commercial alt.space... The latest issue of Aviation Week reports on the inflatable space habitat development going on at Bigelow Aerospace and on the interest the Chinese have shown in collaborating with the company: Private Initiative for Inflatable Space Habitat Lures Chinese Interest - Aviation Week - July.4.04. "a man-tended commercial 'Nautilus' module between 2008 and 2010. The watermelon-shaped Nautilus would weigh 20-25 tons and, once inflated in orbit, measure 45 X 22 ft. with 330 cu. meters of volume. This is larger than the 25 X 27-ft. tractor-tire shaped TransHab and substantially bigger than any individual ISS module." "Two Genesis flights. The 2005 and 2006 Genesis payloads would each be 3,000-lb. units measuring 15 X 6.2 ft. before inflation. Cameras and telemetry would observe inflation to double that size. The Genesis flights would demonstrate inflation technology, pressure integrity and debris-shield deployment." Two "Guardian" flights. Also set for launch on the Dneper, these missions--planned for April and August 2007--would be 45% scale modules carrying critical life-support system test hardware. The company has signed a contract for a SpaceX Falcon V to launch a Genesis payload in November 2005. For the Nautilus "a Russian Proton, Chinese heavy Long March or U.S. heavy launcher would have to be used." Manned suborbital - Scaled Composites SpaceShipOne + all the other suborbital projects. Welcome to the New Space Age. Armadillo ready to fly... John Carmack reports that they will do some flight tests tomorrow with the big vehicle: Ready to fly - Armadillo Aerospace News - July.3.04. ... Joy of Tech! offers a "scaled Scaled Composite." Commercial space meet... Jeff Foust posted an AIAA Commercial Space Forum update - Space Politics - July.2.04. The forum will happen on July 13 on Capitol Hill. As Jeff says, it's an impressive array of speakers. If they seat them alphabetically, Mr. Muncy will be in an interesting position. More Russian RLV designs and hypersonic research. HS reader Fjodor Novozhilov submitted links and info about the Instant AKS ("AKS" - avia-space system) project at the Mig Corporation. The two stage winged system would use maglev takeoff booster. See also MIGAKS at Astronautix. The latest X PRIZE Newsletter has been posted by Space Race News. It includes updates on several of the teams including HARC, which is focusing on developing a business around its Escape Tower Rocket Motor (ETRoM) for its capsule. HARC says that the ETRoM will be its "first rocket business profit center." They report that it produced "over 7000 pounds of thrust in a motor that is only 10 inches in diameter by 36 inches long. The beauty of this motor system is that it is extremely low cost, efficient, and easy to reload for successive flights." Perhaps we will see other teams shift to similar component business models if the prize is won this year. More pictures from the SS1 flight plus the XCOR party: The Story of SpaceShipOne - Samuel Coniglio. ... Mike Melvill gets a profile from his local paper: Tehachapi pilot rockets into history - Tehachapi News - June.30.04 (via spacetoday.net).